With anticipated praise and thanksgiving, we are excited to begin our Capital Campaign drive for our Middle and Upper School Building. Scheduled to open in August 2019, construction is already underway. This building will be home to students in 6th Grade through 12th Grade and is designed to easily expand on by adding wings, which can accommodate the growing population of our school for many years to come. Aside from classrooms, there are 2 Science labs (one each for Middle and High), a multipurpose room for meals and whole school functions as well as a technology resource room, which takes the place of a traditional library. 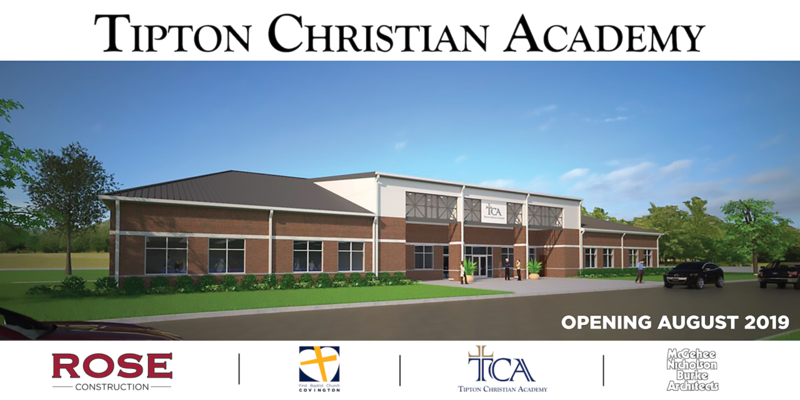 Tipton Christian Academy is blazing a trail in Covington, Tennessee and Tipton County! Christian education cannot be undervalued or overlooked in the age we live in. The importance of instilling Biblical truths and Christian worldview in our children is more imporant now than ever. Training up strong Christians to be godly leaders in our community, state, country and world is our mission. An education focused on excellence for God's Glory and preparation for collegiate success is the driving force of everything we do in the classroom. Thanks to the generosity of several key donors, we were able to begin construciton. Our prayer is to enter this building with zero debt and 100% TCA Family participation. We've set up an online giving service to make donating simple. Click here to set up your account today! Contributions are drafted auotmatically and can be made weekly, monthly or annually. All donations are tax deductible. Any amount you are able to give helps us meet our goal.